Bold splashes of color really frame an artist at work. Paul Cezanne (1839-1906) is known as both a French impressionist and one of the founders of modern art. He worked during a time when concept of painting out in the air in natural light was just becoming popular. Ironically, Cezanne wasn’t truly a fan of the concept, perhaps in part because it took him so long to complete each painting. This Impressionist painting shows an artist in a blue smock going through his supplies looking for just the right paint or brush to complete his own painting. I think it’s a fun painting in that it is a painting of someone who is in turn getting ready to create his own painting. 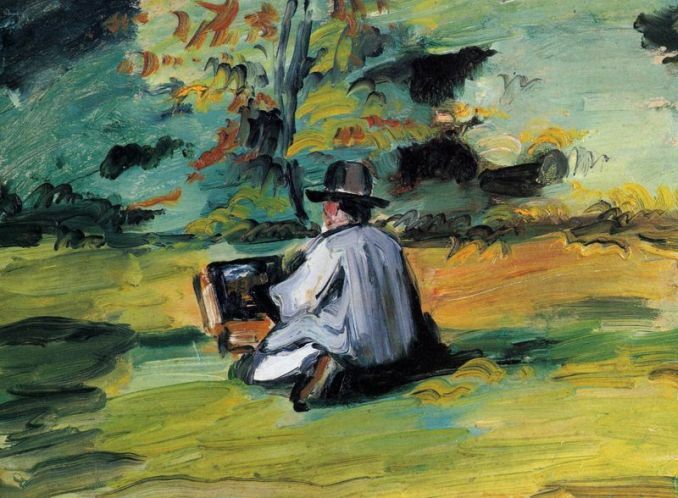 To learn more about the artist or enjoy more of his paintings, please visit our Paul Cezanne biography.